Commercial Lift Singapore is a BCA registered, accredited and certified company that provides a comprehensive Commercial & Industrial Lift Servicing & maintenance for over 10 years. Thanks to our consistently good reputation, we have amassed an extensive range of happy and satisfied clients here in Singapore and worldwide. We provide lift servicing and maintenance for Shops, Hotels, Property Management Companies, Blocks of Flats, Estate Agents, Schools, Local Businesses, Churches, Universities and much more. Commercial Lift Singapore provides a full range of Elevator Services. These include Commercial and Industrial lift installation, maintenance, upgrade & refurbishment, repairs, breakdowns, and testing. We pride ourselves on our friendly team of lift mechanics, who aim to provide the best service for Cargo and Goods Lift, Shopping Mall Lift, Warehouse Lift, Service & Freight Lifts, and Office & Passenger Lift. Our engineers pledge to keep your commercial or industrial lift running smoothly, and safe to use. Not only do we install and maintain lifts, but we also offer expert advice on various elevator choices and alternatives. Building managers, architects, builders and facility managers base their advice and recommendations on specific client needs and prerequisites. Commercial Lift Singapore has perfectly installed many elevators in Singapore and worldwide. Our specialists are always mindful of the wide range of Safety Regulations regarding lift installation, servicing & maintenance. On the same note, our managers and architects are aware of the client’s tastes and requirements. We balance these needs to ensure that each of our customers can get the best value for their money. We offer guidance on the best compliance solutions whenever we undertake a new project. With a highly driven ethical excellence, Commercial Lift Singapore is dedicated to availing qualitative Industrial Lift Repair Service to the esteemed customers. Many of our precious clients appraise our industrial lift repair services for we guarantee on-time execution and promptness. Our deft personnel utilize superior quality tools along with ultra-modern techniques, which make it possible to perform the best lift repair services that clients can count on. Moreover, we ensure that all clients receive the best service at market-leading prices. We strictly follow customer requirements when performing each lift repair service. It is for this reason that we pledge to deliver customized repair services that complement your ultimate expectations. With enriched industrial knowledge and experience, Commercial Lift Singapore technicians provide excellent Commercial Lift Repair Service. Each repair service is executed based on the specific requirements of our valued consumers. Prior to starting the repair job, our experts assess all the steps involved to ensure that the actual job is carried out efficiently. We are proud to have talented professionals, who incorporate top-notch quality tools coupled with innovative techniques to provide the best lift repair service. Needless to say, our commercial lift repair services are available at ridiculously reasonable prices. We are widely trusted and considered the premium specialist that is friendly and efficient. What sets us apart from the competition is our reliability, speed of response, and technical know-how. We always stand out from the crowd because of the many years of experience and the right knowledge. Above all, we have the right tools that suffice every lift repair task. Our company responds to calls swiftly and respects client’s urgency. We always intervene in the case of overriding concerns for loss of productivity or trapped passengers. When called upon for emergency situations, we will avail ourselves on site in less than three hours. When we come to the site, the first thing we will do is diagnose the problem. If necessary, we will confer with our master technicians and then source the replacement components and parts in a jiffy. Our primary aim is to accomplish the lift repair job with little-to-no inconvenience to our esteemed clients. Commercial Lift Singapore aims for same-day breakdown service depending on the availability of parts. We are available during the day, night time and weekends. We reassure property and facility managers that we guarantee 24-hour breakdown service particularly in places where lift performance between storeys is critical. These include schools and fast-paced goods production facilities. 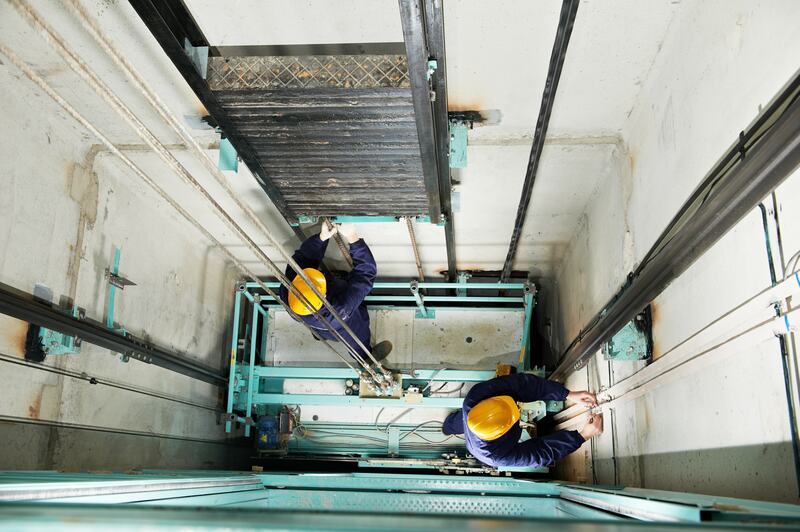 Our company undertakes the full repair of commercial and industrial elevators. These may include gear boxes, door operators, ropes and cabling, control panels, drive units, etc. We have technicians who know how to diagnose the problem quickly. They will source the right replacement part, arrange for fast delivery and then fix and test the equipment within a day. In the quest to minimize inconvenience to lift users, Commercial Lift Singapore’s service managers schedule maintenance calls early. We afford a three-tiered maintenance plan that suits specific needs of a given building structure. Each client gets a service manager to reduce lift downtime and customer anxiety. We seek to execute exceptional services with regard to passenger lifts, more so in cases where users are trapped or unable to use the lift. Call us now for more information. Most elevators have a life span of between 20 to 40 years. Commercial Lift Singapore handles modernization of different mechanical components to prolong the overall life of a lift. We carry out lift upgrade and refurbishment projects even where building interiors need a refresh. Also, we handle renovations where lift interiors look worn-out or unappealing. Our property managers have a duty and responsibility to conduct the health and safety inspections of a lift. We carry out expert inspections and assessment concerning the operation of a building’s elevator, which includes Cargo and Goods Lift, Shopping Mall Lift, Warehouse Lift, Service & Freight Lifts, and Office & Passenger Lift. Commercial Lift Singapore offers comprehensive lift testing services to customers in Singapore and worldwide. Lift testing work is carried out under the strict supervision of highly trained and proficient personnel. Our licensed professional engineers perform testing and certification service on a variety of industrial and commercial lifting equipment. Call us now for a quote and estimate.